The #1 way to find new money this fiscal quarter could quite possibly be through filing your tax return. It is the most significant transaction of the year for millions of Canadians and yet millions of unsuspecting taxpayers leave thousands and thousands of dollars on the table over a lifetime of erroneous tax filing. If you are ready to reverse that trend for yourself and your family, now is the time to jump in and learn more about how to pay only the correct amount of tax—and not one cent more! Where to begin? Often that’s with your prior filed returns. Thankfully, the Canada Revenue Agency (CRA) allows corrections to errors and omissions for a ten year period. For example, in calendar year 2011, one can go back and adjust prior filed returns for tax years 2001 to 2009. So as you get to know more about your taxes, keep that tax tip in your hip pocket. You may in fact be able to recover thousands by adjusting those returns. Tax sleuthing is a “nickel and diming” game, so know that the devil is in the tax details—small and large. In my experience, the most missed tax deduction is the safety deposit box, found on Schedule 4 of the tax return. If the cost is $75 a year, over ten years, that safety deposit box produces $750 in deductions and at a marginal tax rate of 40%, you’ll save $300 on your taxes—$30 a year—enough for Friday night pizza in most communities. Moving expenses are also often missed, and they can be much more lucractive. That’s because real estate commissions—which can run into five figures—are included in the deduction, which is available if you moved at least 40 kilometers closer to the new work or self employment location and had income there. Assume those commissions were $20,000; at a 40% marginal tax rate, that’s worth $8000 to you. That might pay your legal fees, or some of the landscaping costs. The most lucrative non-refundable tax credit, on the other hand, is the Disability Amount, available for those who are markedly restricted in their daily living activities by a disability. This can also be transferred to their supporting individuals in some cases. That credit is over $7000; a percentage of which will offset taxes payable. This is approximately $1500 in real money, depending on your province of residence. Missing this amount over a ten year period—and many families do—leaves you $15,000 short. As you can imagine, this can go a long way to help those needing extra medical or home care throughout a period of chronic illness. There are many more tips and traps to know, depending on your personal and family circumstances. It’s fun to “drill down” and find out more by taking a tax literacy IQ test, a feature of my new book, Essential Tax Facts, 2011 edition. I hope you will pick up a copy to begin your tax sleuthing journey. It’s Your Money. Your Life. You deserve to pay the least amount of taxes possible. 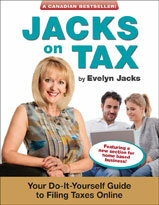 Evelyn Jacks is President of national educational institute, the Knowledge Bureau and author of Essential Tax Facts and Master Your Taxes. She is also a member of the Federal Task Force on Financial Literacy. We all encounter little catastrophes every day in our busy lives. For me it was nearly missing an important flight today—I had to get to the Distinguished Advisor Workshop to speak in London tomorrow—and along the way, I managed to miss all opportunities to eat. A wonderful hotel receptionist went that extra mile for me when I arrived closed to midnight. Completely unexpected, a plate of pastries and fruit arrived despite the fact that all restaurants were closed, a gesture out of pure empathy for my growling stomach! This young woman made my day. Empathy matters. . .a lot. Her gesture was a teachable moment for me. She reminded me that it only takes a little bit of kindness and civility to add value to relationships—even with complete strangers. She turned my initial "note to self" from "better not stay here again" to "I absolutely want to come back again". This young girl was well trained, competent at the task she performed in checking me in and helping with my wake up call. But much more than that, she became memorable to me with her lovely response to my plight. I won't forget her, or the wonderful young man who so carefully chose and delivered my late night morsels to my door. It's Your Money; Your Life. You have a chance to excel every day in your work, and really make a difference in someone's life when you choose to walk a mile in their shoes. That's the difference between good and great! It’s the start of a new decade, thank goodness! Personally, I think it’s going to be a great one; perhaps even a renaissance—a time of rebirth with the wisdom that comes from weathering many storms—financial crisis the most recent–but also terrorism, war, disease, environmental disaster. The sad list went on and on. Yet, there is a great optimism that can follow the weathering of storms—new growth, a better way to do things, new relationships and renewed and strengthened bonds with existing ones. I can’t seem to help it—I am brimming with excitement for the year and the new decade in particular. Incredibly this mood even seems to be reflected in my workouts—I am running longer and faster on the treadmill (even though I have a long way to go to catch up on my fitness level!) And it’s affecting my resolutions in my financial life too: TFSA is done, RRSP is done, portfolio reviewed, and tax return sorting is done. . .as far as possible that is! We are looking forward to serving more clients, better, with the help of the great team at The Knowledge Bureau. And, to add balance, our vacations are planned now to the end of July. . . we have decided to add in more fun because we are committed to laughing more often and enjoying the fruits of our labours! So my wish for you is to plan to achieve your maximum potential in 2011. Revisit what that is, or should be. . . and use all of your resources to your maximum advantage. It’s Your Money. Your Life. I hope the enthusiasm is contagious!